Philadelphia 76ers forward Tobias Harris. One of the first things being said about the Sixers last week when they traded for Tobias Harris ahead of the trade deadline was that his addition gave Philly the best starting five in the Eastern Conference. Well, two games (and two wins) later, and it appears everyone is buying in on the Sixers. On Friday night, with a near nonexistent Joel Embiid who was still recovering from a stomach bug, the Sixers took care of the Nuggets, who have the second-best record in the West. On Sunday, they routed LeBron James and the Lakers in front of a star-studded crowd at the Wells Fargo Center. If nothing else, the Sixers' hot start only confirmed those beliefs that the Sixers are now the class of the East. And this hype train is not slowing down. Over at Bleacher Report, they ranked every team in the NBA by starting five. And the Sixers are exactly where you'd expect them to be — if you're a Philly fan, that is. They have the Sixers' starting lineup of Ben Simmons, JJ Redick, Jimmy Butler, Tobias Harris, and Joel Embiid ranked second behind, you guessed it, the Golden State Warriors. The Raptors and Bucks rank third and fourth, respectively, followed by the Rockets in fifth. It may take some time to jell, but Philadelphia now has the most talented starting lineup in the Eastern Conference. Embiid, Simmons and Redick won a playoff round by themselves a season ago. Imagine what adding Butler and Harris will do. In ESPN's final power rankings before the All-Star break, which came out Monday morning, the Sixers have moved up to the fifth spot after blowing out the Lakers on Sunday, jumping the Nuggets (now 6th) and the Celtics (7th). They're still third in the East according to ESPN, but they've certainly closed the gap between the Bucks, Raptors and themselves. This is also our first look at one of the two god awful nicknames ESPN is trying to force on the world. We'll get to the other, much worse one a little later, but for now, here's what they had to say about the Sixers' new-look starting lineup — a.k.a. "The Philly Phive." Over at NBC Sports, they published their Eastern Conference power rankings on Saturday, before the Sixers routed the Lakers, but one game with Tobias Harris was enough to convince Noah Levick that Philly belongs above Toronto. At least for now. The Bucks still have the best record in the East and made a big move before the deadline, adding Nikola Mirotic. They’re at the top until results suggest otherwise. We got a glimpse last night of how “scary” good this new Sixers team can be. Tobias Harris is the rare 20-point scorer who doesn’t need to see a ton of the ball to thrive, and all five players the Sixers added are average or better defenders. It might take time for all the pieces to work in perfect harmony, but the Sixers have a big, versatile team that can adapt to just about any opponent. This one had to hurt Bill Simmons. Even on the website run by one of the biggest Celtics fans out there, they're singing the Sixers' praises. Here's Haley O'Shaughnessy on what she saw in their first two games with Tobias Harris, which she calls "Butler-and-Ben-proofing," and the rest of the newly added players. Even before they traded for Butler in mid-November, the Sixers offense needed someone other than JJ Redick who could spread the floor. Butler can do many things well, but he hasn’t shot well from 3 over his career and he takes fewer 3s than Brett Brown would like. Simmons put up the first 3-point shot of his career that wasn’t caused by a dwindling shot clock on Sunday, which is a start, but his reluctance to shoot shrinks the court. Throughout Sunday’s game, you could find LeBron James “guarding” Simmons by standing in the paint and daring his young Klutch Sports counterpart to do something about it. Harris is basically Butler-and-Ben-proofing. The 26-year-old wing is shooting a career-high 44 percent from 3 this season, and he’s just as proficient on pull-ups (48.6 percent) as he is off the catch (41.2). If the defense wants to sag off Simmons and protect against one of his trademark thunderous dunks, Simmons now has the option of kicking it out to two of the deadliest shooters at their positions. Harris can set screens for Butler, or, eventually, be the one handling the ball some. Harris is the skeleton key for the Sixers offense. Even Embiid stepped into three 3-pointers with confidence and drilled two of them. The addition of Tobias Harris doesn't just make life easier for Ben Simmons. His presence will also open up the floor for Joel Embiid. 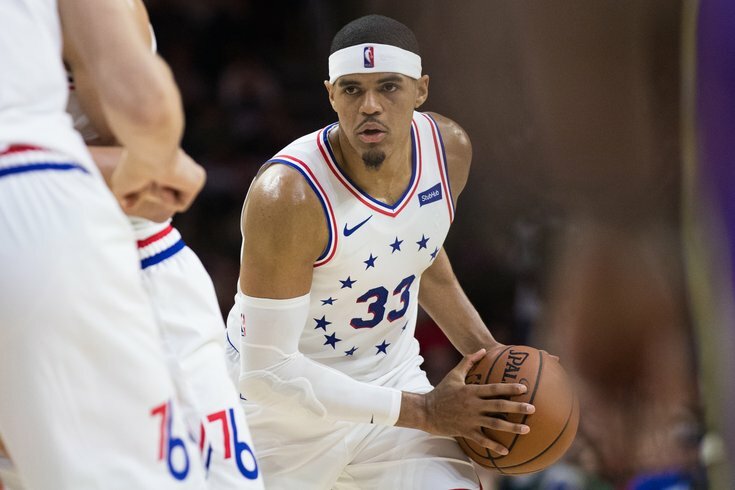 Not that the big man needed the help — he was doing just fine before Harris' arrival — but now the Sixers boast one of the most dominant frontcourts in the entire NBA according to Kirk Goldsberry of ESPN.com. Magic Johnson and LeBron James know just a little bit about basketball — and about winning. And they were left impressed by the Sixers. It's also worth noting that this AP story appeared on Boston.com this morning, meaning Celtics fans were waking up to this on Monday. The Sixers may have the best starting five in the East, but their ability to mix and match players will give them a considerable advantage against opponent's second units on a nightly basis. It's essentially going to be a non-stop matchup problem for the other team. And that's going to help the Sixers win some games against the rare team that matches up well against their starting five. Having four legitimate game changers on a team is fantastic when they’re all on the court together, but it’s arguably just as dangerous when you can stagger minutes and let them thrive against an opponent’s second unit. They can do the same with Harris, or let Butler and Harris run a nightmarish little pick-and-pop game that’s only going to get better as the two get more comfortable playing with each other. They can just run Harris out of the post if he gets a size advantage over his defender. On Tuesday, the Sixers will get their first test against an Eastern Conference rival when they take on the Celtics.